Peeking through my large window at the snow-capped German Alps, magically bathed in the gentle rays of the midday winter sun, I felt like I was in a futuristic fairytale – for there I sat in a full flat bed, my legs stretched out, a glass of fine white wine on my side, Woody Allen’s Café Society playing on my personal big screen, tweeting from 38,000 feet above earth using superfast wifi! The German Alps from my big window. As someone aptly commented on my Facebook page, just a few decades ago, such an experience was the stuff of our wildest dreams. Atleast for a digital nomad like me. Watching Cafe Society with a gourmet meal on business class. You know when you get on a plane and while away the first half hour browsing through the movie selection, reading the brief descriptions, and wondering what to watch? Lufthansa A350’s Companion App syncs with the in-flight entertainment system on the route you’re going to fly, six weeks before you fly, and lets you save your favourites. Thanks to recommendations by awesome tweeps, I already knew I was going to watch Café Society and Azhar (based on the Indian cricketer) on board. Feeling zen on the A350. I have to confess I fell in love with the Lufthansa A350 even before I boarded, for I unexpectedly ran into a co-passenger – a German student who did his PhD thesis on the impact of lights on reducing jet lag. Lufthansa used his research to design 24 LED mood lights on board the new A350, that adjust to the bio-rhythm of the passengers. The lights changed from a gentle blue to a soft orange to shades in between, based on the boarding time, lunch, sleep, dinner and landing. I felt pretty zen by the time we touched down around midnight in Delhi! Ranbir Kapoor and a healthy (vegan) salad. Special goodies on board to celebrate the maiden A350 flight. Ever since I turned vegan and got stood up twice with no special meal on board long flights (despite pre-ordering it), I always carry some back-up vegan food so I don’t starve. That was the plan for this flight too, except that this time, in keeping with the crazy developments of 2017, the Deutsche Bahn train got delayed and rerouted. It took me double the time I had estimated to reach Munich airport, leaving no time to pack something for the journey. I’m glad that happened, because they had gourmet meals on board, prepared by chefs from the Leela Group; my elderly co-passenger, who was from Delhi but lived in Toronto, described her meal as “elegant”, possibly the highest compliment for airplane food. Fastest wifi ever at 38,000 feet! Noise cancelling headphones and work mode on. My eyes used to light up whenever I boarded a long flight and saw the Wifi symbol on board – until I realized that despite being paid, inflight wifi is usually slow and patchy. When I read that the new broadband technology on the Lufthansa A350, that also supports the Companion app, offers superfast, uninterrupted Wifi, I had to try it – for I tend to be a lot more productive up in the air than on earth. And fast it was, so fast that I could upload huge attachments in minutes and get some long-pending work done without distractions. Also read: So You Want to Start a Travel Blog? Ready to take off on the Lufthansa A350. I am often consumed with guilt for the number of flights I take, for it is the biggest contributor to my carbon footprint. So while I love the innovative technologies that made my 8-hour journey so relaxed and productive, what I love more is that the Lufthansa A350 is the most eco-friendly long-haul plane in our skies right now – it consumes 25% less fuel, produces 25% less carbon emissions, and has a 50% lower noise ‘footprint’ than similar aircrafts. Indeed, my productivity and that movie lounge feeling were heightened because I could barely hear the roar of the engines on board. A glimpse of Delhi’s city lights while landing. There was a time when my flying choices were based on getting from point A to point B in the fastest or cheapest way possible. That quickly began to take away the joy of flying. I now think about how productive (both in terms of work done and movies watched) I’ll be on board, how I can offset my carbon footprint, and how tired my body and mind will feel when I land at my destination. To be honest though, on the world’s most modern aircraft – the Lufthansa A350 – the journey itself felt like the destination. Win flights to Germany on the new Lufthansa A350! Premium economy seats on the A350 – spacious and bigger screens too! Put on your thinking hat, take a creative picture of the number 350, and enter this contest by Lufthansa India to win return flights from Delhi to Munich on the new Lufthansa A350. Contest ends Feb 28th March 3rd, 2017. Read the terms and conditions here, and don’t forget to tweet me from 38,000 feet if you win! Have you flown (or dream of flying) the Lufthansa A350? 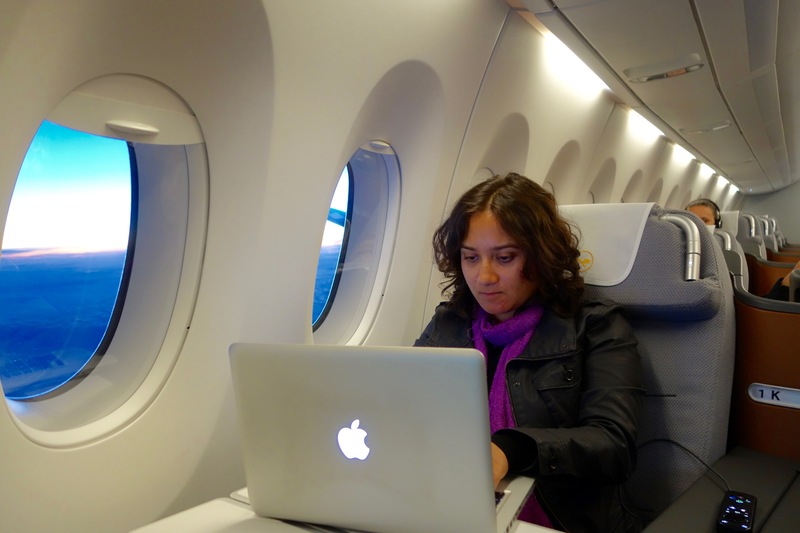 I was invited as a travel blogger to fly on Lufthansa A350’s maiden flight from Munich to Delhi. Lucky me! Join me on Instagram, Facebook and Twitter for unique travel stories from around the globe. This was an amazing post. Loved the way you described it all. OH my Gosh, that is the chance everyone’s been waiting for. How blissful it all seems, I loved the post and am happy you got to experience it. I just love this. I’m so glad I read it. Awesome!! Beautiful! Now I really want to fly in one of these! Great post! Very cool post – thanks for sharing your impressions. Looking forward to my first A350 flight ! I recently flew in United’s new Polaris First class from Narita to Chicago. While the experience was very similar in many ways with the lay-flat seats, gourmet food, and entertainment system, it was not on an A350. I love the difference in the eco-friendly details you pointed out. I look forward to flying on the A350 some day. This makes me excited for my next flight ! This looks so cool (and luxurious). I’m going to enter the contest! Why not even a mention of Airbus??? You made it sound like Lufthansa built this aircraft. Airbus built this aircraft! That looks like a great way to fly! The seat that turns into a bed is enough for me. Thanks for the post. I felt calm, serene and floatng on an (airline) cloud just reading it. A great competition for anyone within the vicinity of Delhi. ‘Such a shame that the competition isn’t from anywhere lol! Will we get to read a post from the winner in the future? It’s always nice reading about the travel experience of an excited customer! It’s good to see some progress, after 40 years of the great stagnation, in the developed world, the A350, B787, airliners, not only have composite wings, but composite fuselages, in fact so light are they, that we should revisit liquid hydrogen, as a fuel for aircraft. The original experiments, by NASA, in the 1980’s, featured an aircraft with metal wings and fuselage, not surprising at that aircraft density, a high volume fuel, meant a low range. But with a low density aircraft, a low density, light weight, efficient fuel can work, just expand the fuselage to accommodate the lower density fuel, the fuselage being the lowest drag part of the aircraft, the wings being the highest drag part of the aircraft, needing to provide less lift, for a lighter fuel, could be smaller, less drag, less weight. We’ve seen important improvements, in rail transport, this last decade, high speed rail in China, the Swiss Alps rail tunnel, the silk road railway (I look forward to variable gauge rolling stock, high speed rail sections, gauge standardization, from 2 changes to 1, halving travel times for freight arriving,) from China to London, magnetic levitation train service, from Shanghai airport to Shanghai city centre. Japan commencing construction, of it’s national magnetic levitation train tunnel network, China beginning it’s exports of high speed rail, to Russia, Latin America, Africa, South East Asia, India. I have high hopes, that the Himalayas rail tunnel will get built, with work underway, on a Chinese rail link to Nepal. A good start, before we even get, to the roaring twenties, clean disruption, peak decade, of the third industrial revolution, with China and India heavily committed to big solar. This one of your best post and i really want to fly one of these aircraft. You are very inspirational! In fact, all your posts make me feel great about travel blogging! Your write-ups are making me blog more frequently these days esp after I revamped my site! Thanks to you! I seem to be confused between “flying the” and “flying on the”. The title I feel is usually used by the pilots in their blogs, as they actually fly the airplane. You seem to have been upgraded from Business class to the cockpit. Nicely written. But i don’t know what to believe and what not to, when it’s a sponsored post. Not just in this post but everywhere. Previous PostSarmoli, Uttarakhand: A Himalayan Village Where Locals Run Marathons and Their Own Instagram Channel! Next PostReflections on Life, Travel and Turning 29.